Typing Test - Play Now! Every time you look at the keyboard or make a mistake, you move your attention away from what you really want to do. Wouldn't it be nice if you could type as fast as you can think? This site is helping you do that. What I'm trying to say is this: speed matters. When you're a fast, efficient typist, you spend less time between thinking that thought and expressing it in code. Which means, if you're me at least, that you might actually get some of your ideas committed to screen before you completely lose your train of thought. Again. I can't understand why professional programmers out there allow themselves to have a career without teaching themselves to type. It doesn't make any sense. It's like being, I dunno, an actor without knowing how to put your clothes on. Recent score distribution (WPM). What's your WPM? Excluding users with a WPM of 0. Take the free typing test now and discover if you are fast. How can a typing test help me? Do you want to learn how to type fast. Key Hero is a typing test but it's also really good if you want to learn touch typing or other techniques to type faster. I personnally touch type using the colemak keyboard layout. I find this layout very comfortable. It helps reducing finger movements when you type and tries to improve certain problem found with the Dvorak keyboard layout. There are a couple of layout you can choose from if you are not happy with the default qwerty keyboard layout. You can find out about this topic on the wikipedia page. A lot of apps have been written to help people improve their typing skills. The difference between Key Hero and the other applications is that it's an online free solution. You won't have to install a thing. You just need any web browser and flash player to start improving your typing skills. Another important feature of the site is all the performance stats. 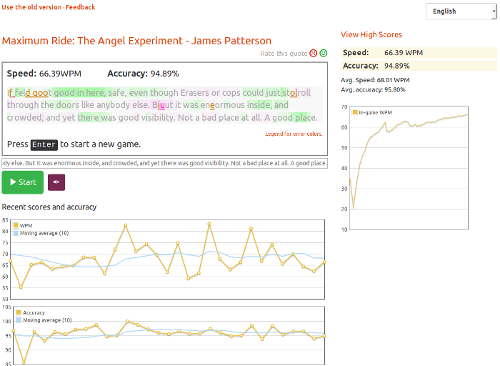 When you are a registered user, you can view a chart of your typing tests and see how you are improving. You can also see your accuracy and how you have progressed. You can get rid of typing software and half baked typing games. Key Hero has everything you need to make you into an A-class typing master. You will soon speed up your typing if you use the site regularly. I believe that if you practice 5 minutes per day during a month you will greatly improve your speed. Your wpm can easily go from 15 wpm to 40 wpm. Trust me this free typing test is good. Whether you are a good typist or not, it will help you get better. Any increase in your typing speed will help you have a better experience when you are using computers. I have tested many games before I decided to create my own. The typing games I found aren't very good. Some of them might be fun for a while but they are not really helping you become a better typist. The problem is that they encourage bad habits. Many of them don't take into account the mistakes you make. For example, let's say you have a game where letters are falling and you have to type them as fast as possible. What's happening when you make a mistake, nothing! You don't have to hit delete to fix your errors. This is just stupid because if you write an email and make some errors while typing, you have to fix them. Those game don't mirror what you are doing when you use a computer for real. Key Hero does.